I regard myself as a skirmish gamer, but not necessarily a successful one! It has been nice to play the recent BMG tournaments and I plan to play more. That means getting a handle on a crew to suit me. 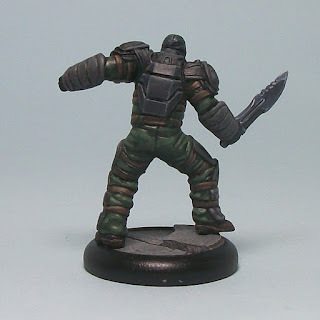 While I don't think there is such a thing as a 'perfect list' in pretty much any table-top skirmish game, I do feel part of getting the 'right list' as a player is having a group of models you feel you understand and that you feel function adequately or better. I am still very much getting to grips with BMG, which is influencing my crew selections. For example, I am happier so far with Black Mask than Poison Ivy. I like Deadshot, as he has performed well in 4 games out of 5. Some models just don't meet my needs, so time for more change: out with the old and in with the new! Riddler is going as his use is too specific for me, but accepting that others may get more out of him; he is helpful but maybe not the most efficient use of Reputation for my tastes. He can be devastating in combo, such as setting up a target for Deadshot, but effectively that almost doubles the cost of Deadshot to do that. Turk has been a mainstay since my first games, but there are more efficient ways to add comparable or superior threat, with better range and/or fewer action Counters needed to attack at optimum rate of fire. Goon 2 has simply been underwhelming. On the plus side, Anatoly has proved useful as a speed bump, tying up more expensive models used to quickly knocking out lower durability targets, so another similar option would be good. So what am I thinking of adding? 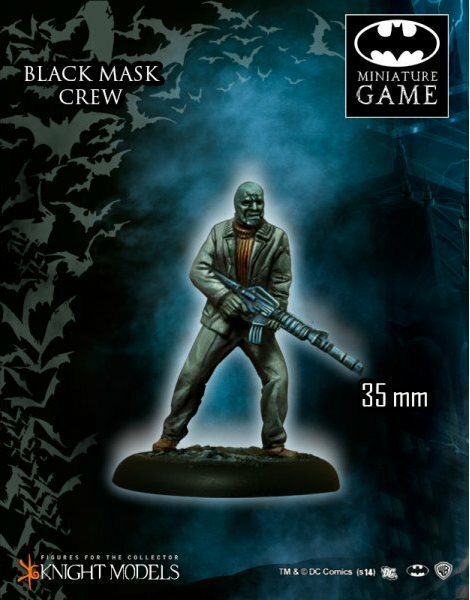 At first I thought of extra cheap Henchmen to add to the 'swarm', especially as so far Black Mask is still quite reliant on the 'generic' Henchmen, but then I thought I need more of a mix. That frees up plenty of Reputation for Mule Goon instead of Goon 2, who is more durable and has a higher likelihood of causing Damage. I could take 2 cheaper Henchmen instead of Mule Goon, but that doubles the VP available to an opponent, so sometimes 'less may be more'. 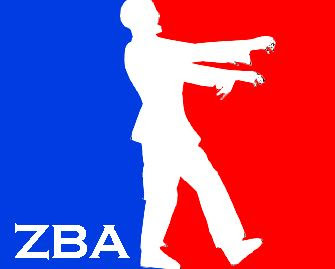 Identifying these changes allows me to plan for the next tournament with something closer to the 'right' crew for me. Basically, in looking at the basic Damage output of Mule Goon against Defense values 2 to 5, he is more cost-efficient than either Prisoner 01 or Goon 2. That is not factoring Collateral Damage, but it is telling enough for me. On the durability front, Veteran and Sturdy make the Mule Goon a potentially tough proposition, and not readily taken down in a single attack except maybe to pesky 3 Blood attacks. The more I think about it, the more I think taking Mule Goon will add some better balance to some of the other cheaper Henchmen. My second tournament, my second tournament crew! After being dissatisfied with the game-play of the Poison Ivy crew, I decided to take a different tack, reusing a couple of models to form this crew. Principally, my main threats are from Deadshot and the Henchmen, except Prisoner 04 who will primarily Bodyguard Black Mask. 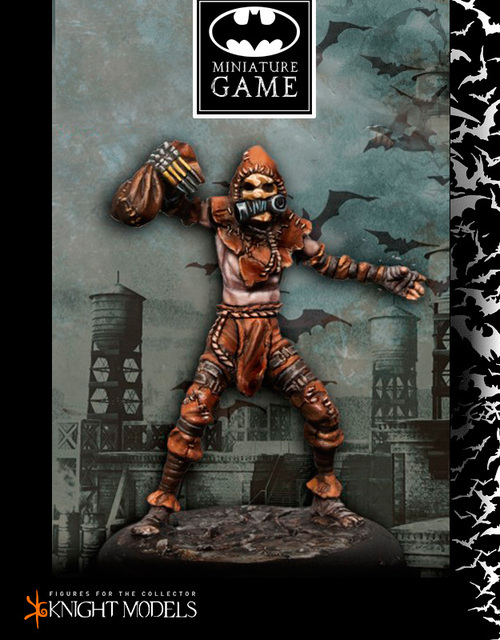 Riddler is mainly included for game control, but that will require me getting to grips with him! Black Mask: I need to try and ensure I am using Inspire and No Mercy! in most rounds. Riddler: using his Confusion and/or Disarray abilities to limit major threats. That said, even though I neglected to use No Mercy in the test game, it would have made no difference as even with Brutal re-rolls for the collateral dice a few times in the game, I could not get a '6' to save my life. Hopefully I will make maximum use of those 4 key abilities in future. In all the crew has a number of abilities (Personal Traits and Special Traits) for me to remember in game: Bodyguard; Brutal; Confusion, Criminal: Disarray; Dodge; Expert Marksman; Football Gear; Gunman; Inspire; Let's Go; Mob; Night Vision; No Mercy; Order; Rapid Fire; Puzzle Master; Shooter; Strategist; Street Guy; Tireless; and Trickster. So yes, quite a lot to remember, 22 Traits there by my count. Definitely a feature of Confrontation-inspired skirmish games, and BMG does show some of that kind of lineage. Anatoly is the last mini I needed for my newest crew. I had put off painting Anatoly simply because he looked the most complicated of the Black Mask Henchmen to paint of those I had chosen, but included him because I read some very positive stuff about how he functions in the crew. He looks to be a pretty decent and durable option for a relatively low cost, so all good. 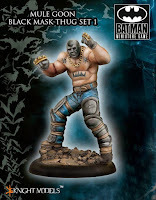 Unfortunately I have not had the time to get him on the table to try him out, so I am far from sure I will fully get to grips with him in the upcoming tournament! The model had a horrendous mould line, one that meant I simply had to hack at parts with my scalpel to get something approaching a cleaned up model. 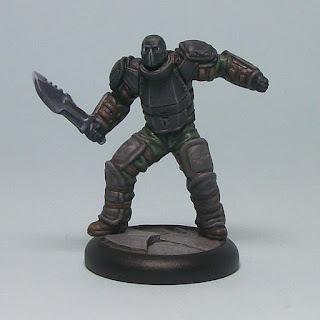 That was compounded by Knight Models choosing that the model would be sculpted to struggle to fit on the designated base size, and he had a lump of metal that I wanted to cut away from his feet for aesthetic purposes. Despite all of that, and despite my reticence about painting Anatoly, I am quietly pleased with how he turned out. 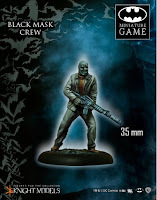 So much so, that I want to paint the last two Black Mask Henchmen I have (Mesh and Mule Goon) and get a few more games in soon with the crew. 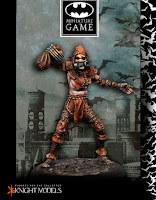 in addition, I have part-painted Scarecrow, so would like to finish him soon. Freebooter's Fate - First Game! Rob and I finally played our first game of Freebooter's Fate, and I really enjoyed it. We played with the crews we had, matching 395 doubloons and 6 Pirates for Rob, and 390 doubloons and 5 models for my Brotherhood. As our first game, we opted against adding equipment, simply to keep things as manageable as possible. We were definitely learning as we were going, but I think we picked up some key things quite quickly, and I like the card driven game mechanics. In fact, I really like the combat mechanics for a couple of reasons. Firstly, trying to out-think your opponent's choices in combat; when Attacking or Defending you secretly choose which body locations (of 6 choices) to attack or protect. When attacking, as the game progressed I was always trying to include a location I thought Rob wouldn't protect, not just the most tactically beneficial targets. When Defending, I was trying to cover the locations I thought he would go for. Second, as a model takes critical hits, you are effectively forced to protect those locations, making it easier for the Attacker. I like that things become progressively harder for injured models. There may be a down side to that I have yet to see, but I think it is pretty elegant in function. Add in that base Defense is typically 3, and base Attack value is typically 2, and the Defender does have options, especially if they use cover etc. During the game I was very, very lucky with some of my Attacks, so much so that Rob's Leader was taken out early in the game. My crew hugged cover as they advanced, and my Leader took advantage of it for his Shadow Run ability. We took away from that impact that Rob should have kept more open ground between his models and mine, and probably should have let me cover more of the open ground between us. The game had moments of drama, both great and small: the Pirates hunting my Brotherhood through the little alleys and streets created by our terrain layout; the Pirate Leader being brutally injured by a sneaky assassin attack by Apagado; 3 Pirates ganging up on my hapless Coscritti; my Harlequin leaping on top of a cart to get better range to shoot a pirate shooting out from a window frame; my Master Assassin using Shadow Run to attack a Pirate who was defending a doorway in a house. I think we both enjoyed the game, and we have discussed further additions in terms of adding to our available terrain and also future crews: Rob is thinking about Imperial Armada, and I am thinking about a Mercenary crew as there are a couple of characters who allow you to build an all-Mercenary crew. I am really looking forward to the next game! These are some alternative bits I will be using for BMG games. The Riddles were a necessity as the Knight Models Objectives pack only comes with one Riddle, and with the hard-cover book release they changed it to be a pair which was not too well thought out IMHO. 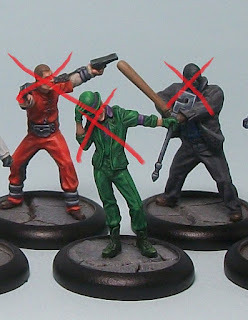 For these I simply ordered some question mark shaped acrylic markers from Counterattack Bases. I used a very, very fine sanding block to key the surface for spraying, then painted them and done. 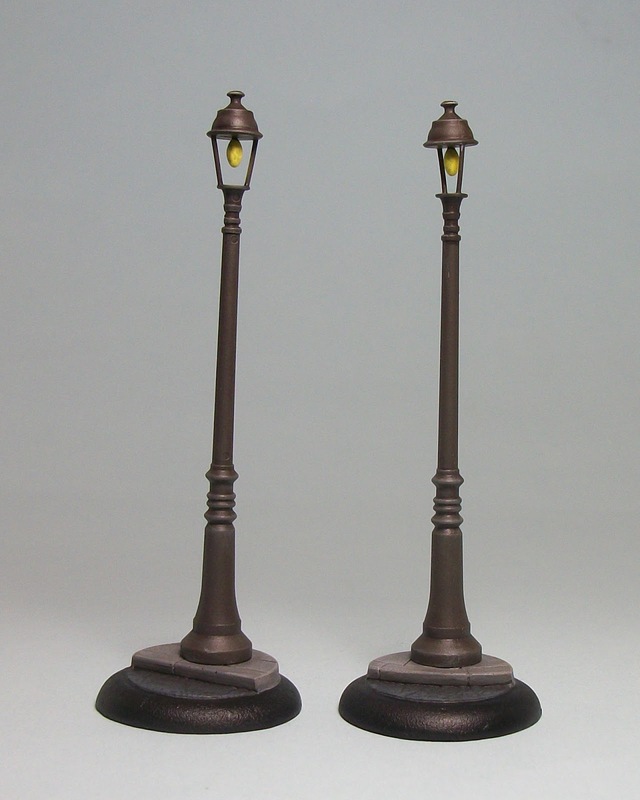 I have a couple of packs of the first Lampposts KM did, and I was unimpressed. I packed my first 3 safely into my figure case for the first BMG tournament I attended. Unfortunately the poor design meant a light tap with my finger nail pinged the upper part of one from the main body. 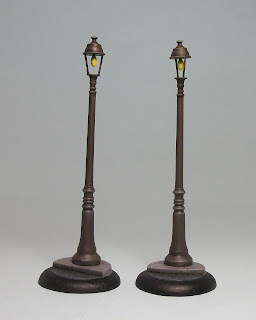 Consequently I will be using these going forward which are plastic and from a Tamiya set. they will prove more durable, I have little doubt. 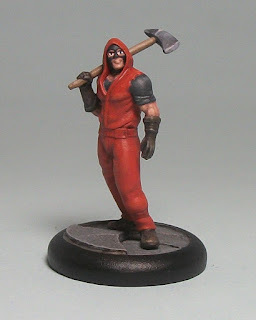 Another Blackgate Prisoner to to add to my collection, and more specifically the Black Mask crew I have been working on. 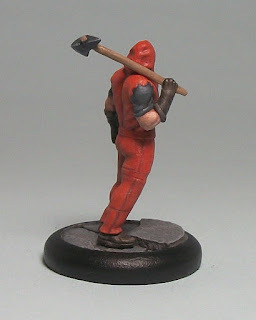 Currently I have one mini to finish for the tournament crew. The pictures have washed out the highlights on the orange, which seems to happen each time I photograph a Prisoner. Still, overall not my best work, but in all honesty I don't get very enthused by painting the generic thugs that comprise most Henchmen, so most importantly it is 'done'. The main reason for picking this Henchman was the decent amount of Blood Damage he offers; his Axe is a potent weapon doing 2 Blood, with Handy to re-roll misses and Heavy to Damage on a 4+. All pretty straightforward and potentially brutal. I hope to get a practice run out with part of the crew this week, so I should try out some of the newer additions I think.